Jean-François Lyotard, 1924–1998As a boy, he wanted to be a Dominican monk, a painter, or perhaps a historian. Whilst he was not afraid of poverty, chastity was not for him. He had no artistic talent, and his poor memory made him an unlikely historian. And so he became the philosopher who died of cancer on 21 April having lived on borrowed time since 1996, when he went into remission. The would-be Dominican became the apostle of a devout philosophical paganism that subscribed to no theoretical piety. The frustrated painter became the iconoclast of representation, but also the celebrant of the sublimity of American abstractionism. The amnesiac historian became the theorist of the events that rupture the fabric of narrative history as surely as the ﬁgural disrupts the discursive. The association of Lyotard with the postmodern is so immediate, and the success of The Postmodern Condition so great, that other aspects of a complex thinker and a varied career tend to be obscured. The irony is that the story of our disenchantment with grand narratives has become the grandest of postmodern narratives, and has given its author the authority he so contested. This was the man who once thought of publishing an unsigned book with no title, only to realize the law of value would make such a rarity a very precious and prestigious commodity to be consumed as conspicuously as Duchampʼs ʻreadymadesʼ. The dazzlement of Lyotardʼs best-known book blinds us to the existence of an introduction to phenomenology, ﬁrst published in 1954 but still in print and still a good survey, which might be seen as initiating the dialogue with Merleau-Ponty that feeds into his best writings on the visual arts. Lyotard has been so many things in a career marked by so many shifts of perspective: phenomenologist, philosopher of desire and libidinal economist, leader of the assaults on metalanguage and metatheories, political activist on many a front. He moved in so many directions, took up so many temporary positions, that it is hard to capture his drift (dérive), to use a favourite word that hints at Lyotardʼs secret kinship with the Situationists. No single book – there are twenty-seven of them and no doubt posthumous works will speak against the silence of death – encapsulates his multiple concerns and interests, but all are representative. 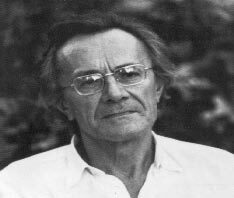 Born into a modest family in 1924, Lyotard studied at the Sorbonne in the heady postwar years, and established lasting friendships with François Châtelet, Gilles Deleuze and the novelist Michel Butor. In his ﬁrst article, published in 1948, he wondered if the youth he was supposedly enjoying really was a youth now that ʻour notion of humanity has been killedʼ in the war, and concluded: ʻLetʼs be consistent: we donʼt give a damn for tradition. And letʼs choose an extravagant personal adventure.ʼ In 1952, he left with his wife and child to teach in a lycée in Constantine, apparently believing that Algeria was the end of the world and that he could peacefully bury himself there. Instead, he met the historian Pierre Sourys, who helped him to embark on what he calls, in Dérive à partir de Marx et Freud (1973), the ship of fools known as Socialisme ou Barbarie. His fellow passengers included Cornelius Castoriadis (whose obituary appeared in Radical Philosophy 90), the political philosopher Claude Lefort and the psychoanalyst Jean Laplanche. Unlike the ship of fools that Foucault described drifting along the quiet waterways of northern Europe, Socialisme ou Barbarie navigated stormy waters. Most of those travelling on this tiny vessel had been involved in the Trotskyist Fourth International, but the critique they developed applied to Trotskyism and Stalinism alike. The Soviet Union could not be regarded as a workersʼ state, degenerate or otherwise, and Marxism itself had become an oppressive force embodied in a Party that could crush dissent because it was in possession of the Truth and could tell the True Story. The disillusionment with grand narratives set in long before the publication of La Condition postmoderne in 1979. Although Lyotard broke with Socialisme ou Barbarie in 1963, his involvement in the group shaped the political views that would motivate him to join the Mouvement du 22 mars in 1968, when he was working in the eye of the storm at the University of Nanterre, and to support the plethora of ʻminoritiesʼ spawned by May 68 and celebrated in Rudiments païens (1977). Yet it might be more accurate to say that Socialisme ou Barbarie conﬁrmed views that he had already formed. Lyotard did not board the ship of fools empty-handed, and his luggage contained the memory of Constantine, the memory of a poor but ancient wisdom, of episodic violence, and of an entire people who had been offended and humiliated. The two years he spent there before the outbreak of the Algerian war were, he wrote in 1989, the moment of his political awakeningLyotard was Socialisme ou Barbarieʼs principal spokesman on Algeria and when he republished his Algeria articles in 1989, just as the wretched of the earth came on to the streets once more and just as that country descended into the new hell from which it has yet to emerge, he was repaying an old debt. Lyotardʼs support for the Algerian cause was critical and clear-eyed. He did not speak for others, and did not identify with the nationalism of others. The FLNʼs monolithic bureaucracy and its self-proclaimed monopoly on the truth made it certain that independence would not lead to socialism. One of the unexpected casualties of the Algerian war was Lyotardʼs belief in the Party. The war brought about the demise of a certain idea of politics, or the realization that the choice between vague reformism, pious Stalinism and futile gauchisme offered no political solution or escape. In retrospect, the articles on Algeria seem to anticipate Lyotardʼs later concerns. What better example of a differend, or a dispute in which the parties involved speak such radically heterogeneous languages that there can be no agreement and therefore no just solution, than Algeria? Which French legislator and what court of law could undo the wrong and injustice that was done when it was proclaimed that Algeria was part of France and did not exist in itself? And what better example than the horror of Algeria of the necessity for anamnesis, the need not to forget the immemorial that cannot be spoken. Auschwitz is Lyotardʼs ultimate immemorial – the unspeakable that must not be forgotten – but ʻAlgeriaʼ is also the name of a forgetting that began when the war without a name was still going on. Writing on the France of 1960, Lyotard remarked that a certain idea of politics had died: talk of the democratization of the regime, or of the need for a large uniﬁed socialist party, was as futile as it was meaningless. He returned to the same theme in 1983 when a spokesman for the Mitterrand government asked the ʻintellectualsʼ to take part in the great debate over how France has to mutate in order to modernize. For Lyotard, the answer lay in the abandonment of such stories about modernization, and the attendant notion of the ʻintellectualʼ who tells grand narratives in the name of universal values. Other forms of association and sociability had, he argued, to be found to unleash a human potential and creativity that was caged and frustrated, but not extinguished. They might not lead to socialism, but the alternative is surely barbarism. Drift on, Jean-François Lyotard.